Slovenia (Standard Post). This is Subtitle. Slovenia [sloh-vee-nee-ə], officially the Republic of Slovenia, is a nation state in Central Europe at the crossroads of main European cultural and trade routes. It borders Italy to the west, Austria to the north, Croatia to the south and southeast and Hungary to the northeast. It covers 20,273 square kilometres (7,827 sq mi) and has a population of 2.05 million. It is a parliamentary republic and a member of the European Union and NATO. Relative to its geography, history, economy, culture, and language, it is a very diverse country distinguished by a transitional character. It is characterized by a high economic and social level. Its capital and largest city is Ljubljana. Four major European geographic units meet on the territory of Slovenia: the Alps, the Dinaric Mountains, the Pannonian Plain, and the Mediterranean, with a small portion of coastline along the Adriatic Sea. The territory has a mosaic structure and an exceptionally high landscape and biological diversity, which are a result of natural attributes and the long-term presence of humans. 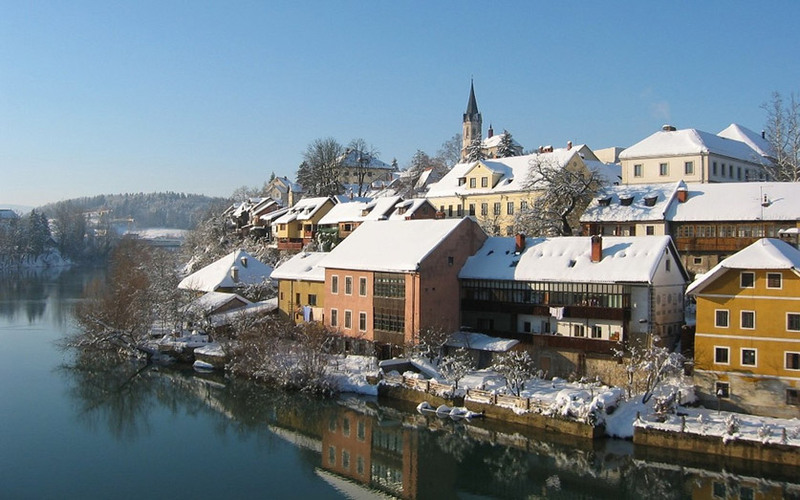 Although the climate in the mainly hilly territory is influenced by the continental climate, the Slovene Littoral enjoys the sub-Mediterranean climate, while the Alpine climate is found in the north-western part of the country. The country is one of the most water-rich in Europe, with a dense river network, a rich aquifer system, and significant karstic underground watercourses. Over half of the territory is covered by forest. The settlement of Slovenia is dispersed and uneven. The Slavic, Germanic, Romance and Finno-Ugric linguistic and cultural groups meet here. Although the region is not homogenous, the predominant population is Slovene. Slovene is the only official language throughout the country, whereas Italian and Hungarian are regional minority languages. Slovenia is a largely secularized country, but its culture and identity have been significantly influenced by Roman Catholicism as well as Lutheranism. The economy of Slovenia is small, open, export-oriented and, subsequently, strongly influenced by international conditions. It has been severely hurt by the European economic crisis, started in late 2000s. The main economic field is services, followed by industry and construction. Many Slovenians reach top sport successes, particularly in winter sports, water sports, mountaineering, and endurance sports. Historically, the current territory of Slovenia was part of many different state formations, including the Roman Empire and the Holy Roman Empire, followed by the Austro-Hungarian Empire. In 1918, the Slovenes exercised self-determination for the first time by co-founding the internationally unrecognized State of Slovenes, Croats, and Serbs, which merged with Kingdom of Serbia into Kingdom of Serbs, Croats and Slovenes (in 1929 renamed into Kingdom of Yugoslavia). During World War II, Slovenia was occupied and annexed by Germany, Italy, Croatia, and Hungary. Afterward, it was a founding member of the Federal People’s Republic of Yugoslavia, later renamed into Socialist Federal Republic of Yugoslavia. In June 1991, after the introduction of multi-party representative democracy, Slovenia split from Yugoslavia and became an independent country. In 2004, it entered NATO and the European Union, in 2007 became the first former Communist country to join the Eurozone, and in 2010 joined the OECD, a global association of high-income developed countries. Testing to see default avatar.